Rothley has hundreds of trees, unlike some parishes where they are very sparse, so recording them is a long-term project. Some are recorded for their size, others for their historical interest and many as future Ancient Trees. The Ancient Oak above was blown down in the gale of 2000. It has a girth of 6m. Photograph taken in July 2002. It is also a sad fact that many records are of trees in a very bad state due to age, weather and species but this will help to identify the future of our landscape and what can be done about it. Another very important reason for recording our natural heritage is to give a case against industrial and domestic sprawl, which destroys our countryside once it gets a foothold. The Oak above is in Rothley Park. It is Tree No. 426 with a girth of 4.9m. Photograph taken in March 2005. Ancient Trees are those with a girth of 3.77 metres or more measured at chest height or 3.0 metres for Ash Trees. In addition, some trees are ancient due to age but without the girth and these are also classed as Ancient Trees. 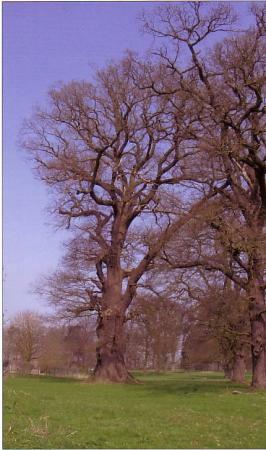 A view of trees in Rothley Park in March 2005. Others are of interest because they are Ancient Parish Boundary Trees. The Oak above is on the Ancient and Current Rothley Parish Boundary. It is Tree No. 226 on Thurcaston Lane and has a girth of 4.9m. Photograph taken in January 2004. Some are 'forgotten' trees such as Walnut, once highly prized for furniture making but then lost out in the early 18th century to Mahogany from West Africa. We still have Walnut Trees in Rothley and 8 so far have been recorded. Sadly, one has succumbed to honey fungus and cut down in February 2006. One of its walnuts produced a young tree, which was planted in the Donkey Field in 2005 so its spirit lives on. Ancient Walnuts are described as having a minimum girth of 1.22 metres (4ft) and the largest in Rothley was recorded at 3.2 metres (10ft 6in). Above is a Walnut in the front garden of a house in The Ridgeway. It is Tree No. 47 with a girth of 1.46m. Photograph taken in September 2002. 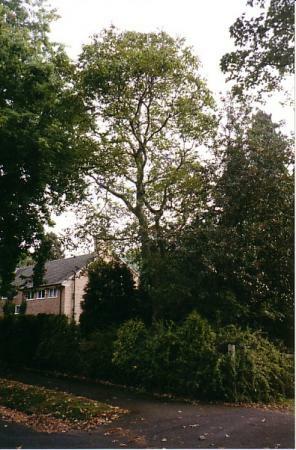 Rothley has many Historical Trees like the Oaks that lined Thomas Babington's Carriageway from The Temple (now the Rothley Court Hotel) to the main road to avoid driving his carriage through the village. 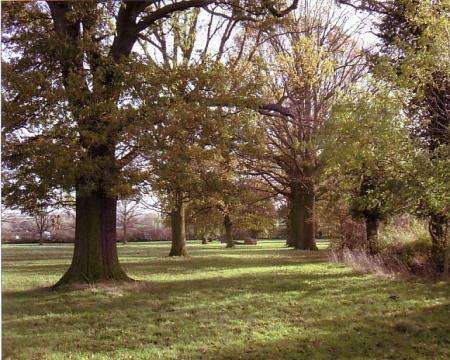 Many of these trees have been lost and the carriageway is on private land but the route with its trees is being recorded as a separate project and is currently underway (March 2006). The two photographs above show the tree-lined Thomas Babington Carriageway. 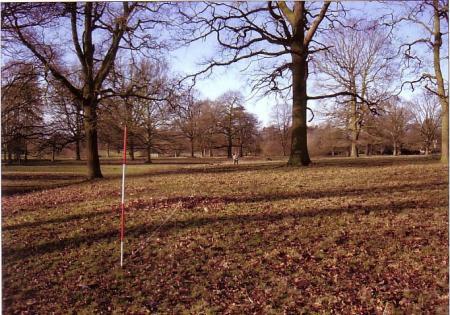 The top one is an avenue of Oaks through South Hall Field bordering the old A6 with the photograph taken in November 2005. 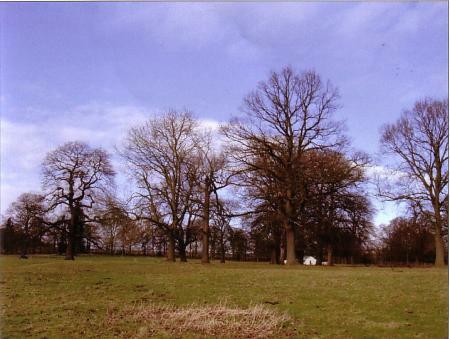 The lower one was taken through the Oaks in Rothley Park as the carriageway approaches The Temple. Photograph taken in January 2006. Our living Royal Oak is in a private garden and tradition has it the Henry Vll and his son, later Henry Vlll, when visiting the Monastery at Ely, stayed for a few days with the Archdeacon at the Rectory at Wilburton. 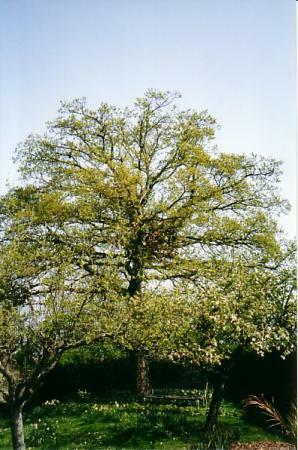 The King is said to have planted an Oak which now stands on the main Haddenham-Ely road at the junction with Station Road at the east end of the village of Wilburton. 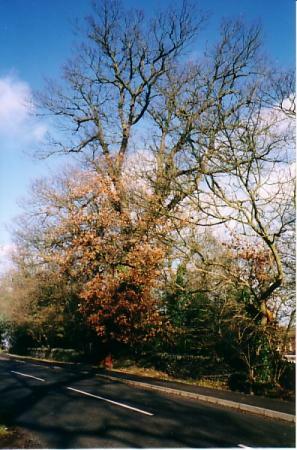 An acorn from this Oak was planted in Rothley and the Title Deeds hold correspondence to this effect. 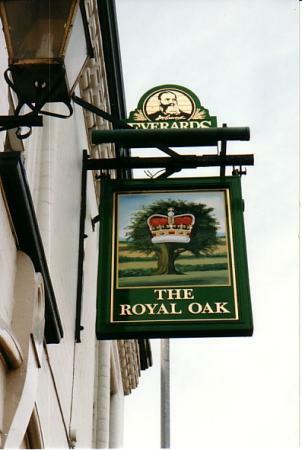 The owner of the original Royal Oak in Wilburton 'finds it an expensive luxury to own, as, over the years, it has had to be braced up and cut back'. The owner also has a pang of conscience following an article some years ago in his local press that reached America with the result he was sent a coin from there to buy an acorn but the address was mislaid. The American tree would by now have been over 50 years old but at least we have ours in Rothley. The living Royal Oak shown above is in a private garden. It has a girth of 2.0m. Photograph taken in April 2003. 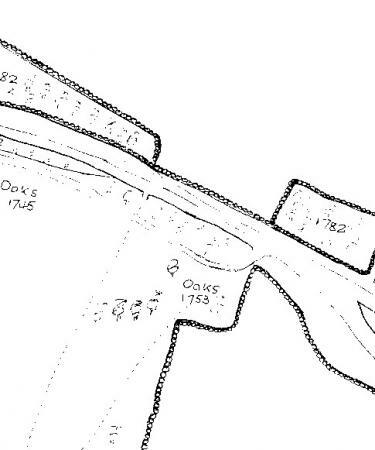 Most of our Ancient Oaks are in the area of Rothley Park and on Rothley Temple Estates land. 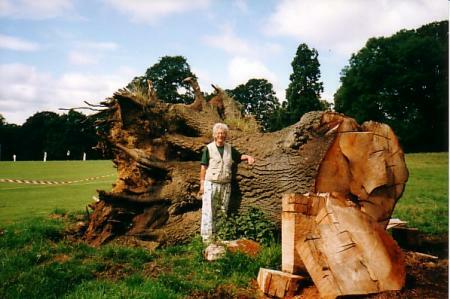 Our biggest tree to date is an Oak with a girth of 7.51 metres (24ft 8in) and in very good condition. It can easily be seen from the car park of the Rothley Court Hotel (formerly The Temple). Above is our biggest tree in Rothley. Tree No. 100 with a girth of 24ft 8in in Rothley Park. Photograph taken in April 2005. 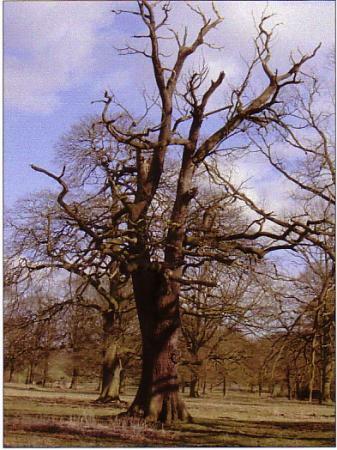 Up to May 2006 I have recorded 552 trees of varying girths, some Ancient Stumps, others in a state of decay but excellent for wildlife, historical trees, interesting species and others because they are the future of our landscape. Anyone tree hunting with me has to be prepared for my exclamations of wonder and delight as I find treasures that I never knew existed. Some trees can be dated from old maps, dates of planting a spinney, if they were grown from seed, even where in the country the stock came from. Above is part of a map prepared in 1819 for Thomas Babington of Rothley Temple. The planting dates were added in script by Thomas Babington. 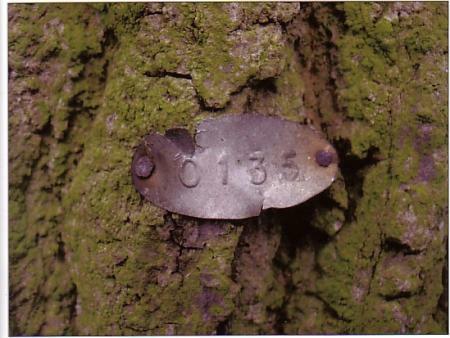 The dates refer to trees in Rothley Park and the other side of Westfield Lane. A few trees in Rothley Park have a metal disc but origin not yet traced. Photograph taken April 2005. The Rothley farmers and landowners have been most generous in allowing me access to their trees and the Countryside Code has been strictly followed. No land is entered without permission and access has to be established as continuing or single visit. This is very important if the land is used for shooting. Never go without your wellies and always wear old clothes as you can be sure that cows will congregate near an electric fence just where you want to perform your 'commando roll' to access your site. None of this recording would have been possible without the encouragement and support of the Community Heritage Initiative Team based at Holly Hayes in Birstall. They provided all the training, recording forms, safety instructions, base maps and technology. Trees are natural monuments, very often taken for granted in our villages and it is very important that we make everyone aware of our living treasures. XHTML 1.0 validated. WCAG compliant. Page generated in 0.2227 seconds.